Executions have always been a cause of controversy in Indonesia. The pros and cons of this type of penalty particularly come to the fore at the time of execution of those who have been sentenced to death by the courts. Despite executions still being carried out, those who oppose the death penalty never stop demanding its revocation. 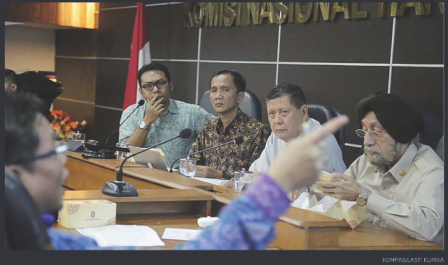 In order to analyze the whole subject of capital punishment in Indonesia, the National Commission of Human Rights of the Republic of Indonesia (Komnas HAM) in cooperation with the Foundation for International Human Rights Reporting Standards (FIHRRST) have conducted a series of Hearings on Capital Punishment in Indonesia. Diverse perspectives relating to capital punishment were comprehensively discussed in order to obtain an objective understanding of the subject. The Hearings were held on three separate occasions: capital punishment from a religious perspective (15 October 2015); medical, ethical and psychological perspectives (20 November 2015); and legal, political and human rights perspectives (26 February 2016). These three Hearings involved input from some 25 sources including religious leaders, medical experts, psychologists, capital punishment lawyers, government officials, law enforcement officers, non-governmental organizations, political experts, diplomats and academics. The viewpoint of the first perspective provides that capital punishment denies any possibility of potential improvement in the character of the human being. Such a change must be supported by social conditions that provide opportunities for those who have violated the law to atone for their actions. When an execution is carried out, dignity, love and forgiveness, all of which strongly relate to humanitarian sensibilities, are no longer possible. Nevertheless, the sources offered the possibility of formal revision of national law by acknowledging the points of view from the various religions that suggested capital punishment be retained only for the most exceptional of crimes. From the second perspective the sources offered opinions that capital punishment can impact on physiological and brain functions that may be detrimental to the convict’s mental stability. In addition, it may also have a psychological impact on the state apparatus involved in the process of execution. Moreover, uncertainty in regard to the actual time of execution inflicts double punishment on those convicted as they undergo both imprisonment and, eventually the death penalty. Therefore, the Hearing recommended that should capital punishment be the penalty then the execution should be carried out immediately on the completion of all legal recourse. If the execution is not carried out within five years, the penalty should be reviewed in accordance with prevailing laws. The third perspective reveals data from BNN showing the number of drug users in Indonesia did not decrease following the executions carried out in 2015, but in fact significantly increased by 40.5%. Indonesia is a country that still retains the implementation of capital punishment for those convicted of serious crimes that affect the state and national affairs. The Hearing thus concluded that capital punishment is a verdict of state law that is not based on arguments concerning human rights. This series of Hearings was constructively and openly conducted whereby each party was willing to listen and make an effort to understand the perspective of other parties.